Hard to believe it’s five years already since we lost Saneeya to asthma and a traffic jam in Sao Paulo, Brazil. 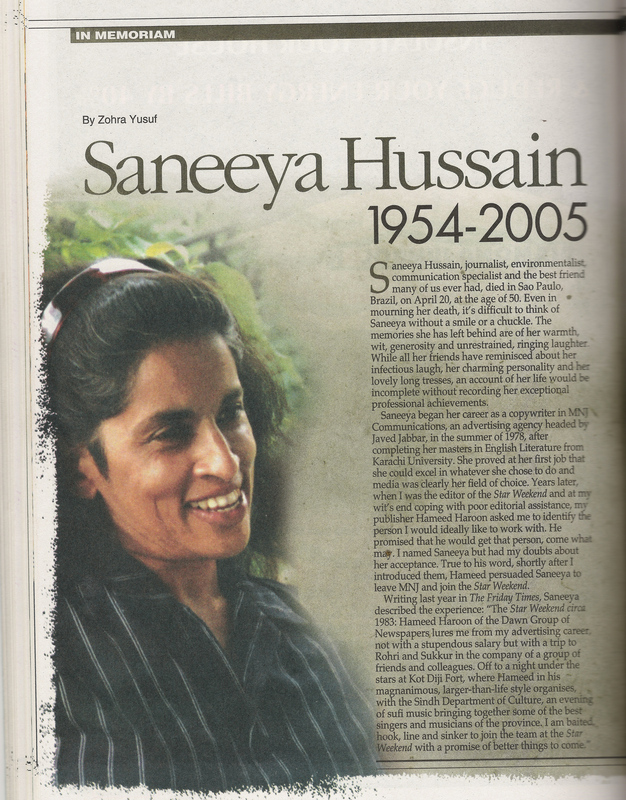 Our mutual friend in Sri Lanka, Nalaka Gunawardene remembers her in a blog post today titled “Remembering Saneeya Hussain of Absurdistan, five years on…”. “Absurdistan” is the delightfully whimsical word Saneeya coined, in her email to me in March 2005 in response to news of the attack on women participating in a ‘mixed’ (non-segregated) marathon in Gujranwala. Just two days later, we learnt that she had gone into a coma, from which she never recovered. I used “Absurdistan” as the headline of another article after she’d passed away. Saneeya, we will always miss you. Thanks to all those who are supporting the Saneeya Hussain Trust run by her family and friends to provide educational scholarships to deserving women and girls. See my chapter “Uphill and downstream in Pakistan”, on Saneeya and environmental journalism in the recently published collection “The Green Pen” by Sage, India. Here’s to Saneeya – we’ll always miss her. It is wonderful that the Saneeya Hussain Trust is up and running. Please do check it out at http://www.saneeyahussaintrust.com/ – The Trust has already done a lot of valuable work in terms of helping young girls obtain an education. I finally made a blog (on which I post my own articles and other material that I also send to my issues yahoogroup) – have linked the SHT to it also. I’d encourage all those of you who maintain blogs or websites to do the same.